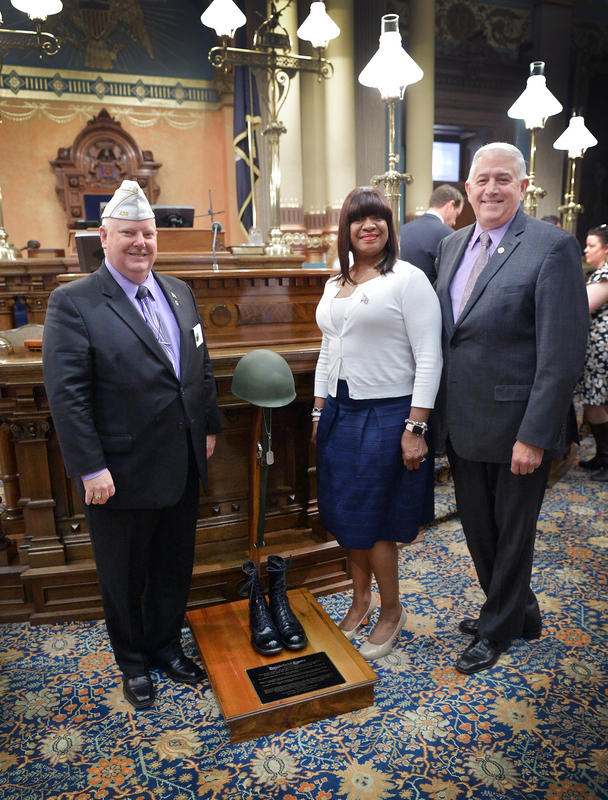 LANSING, Mich. — State Sen. Ken Horn, R-Frankenmuth, welcomed Kimberly Napoleon, commander for the Wallace C. Schultz/Dwight A. McKinney Jr. Post 9931, in Bridgeport, to the Capitol for the Michigan Senate’s 24th Annual Memorial Day Service on Thursday. Napoleon was the first female commander of her local Veterans of Foreign Wars post and the first African American woman to command a post in the state of Michigan. She is a veteran of the U.S. Army and served during three military operations, including Operation Just Cause, Operation Earnest Will and Desert Shield/Desert Storm during the Persian Gulf War from 1987-1996. She was awarded the Bronze Star for her bravery and sacrifices on behalf of this country. Editor’s note: A print-quality photograph of Horn welcoming Thursday’s guest is available by clicking on the image or by visiting the senator’s website at www.SenatorKenHorn.com. Click on “Photowire” under the Media Center tab. PHOTO CAPTION: State Sen. Ken Horn, R-Frankenmuth, stands for a photo on the Senate floor with post commander Kimberly Napoleon, his guest for the Michigan Senate’s 24th Annual Memorial Day Service.